1 of 4 Fill a large skillet halfway with water; bring to a boil. Poach chicken 7 minutes or until cooked through. Let cool, then shred with two forks. 2 of 4 Remove skillet from heat and wipe clean. Coat skillet generously with nonstick cooking spray and place over medium-high heat. Cook mushrooms 5 minutes, stirring occasionally, or until softened. 3 of 4 Spread all 4 tortillas with 1/4 cup refried beans. 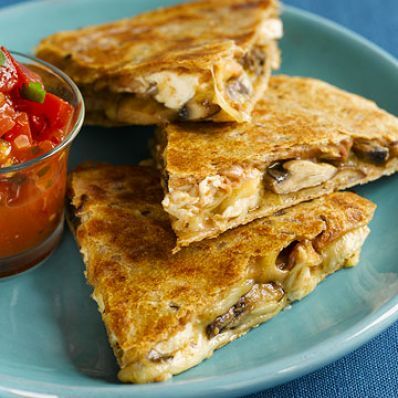 Divide cheese, chicken and mushrooms between 2 of the tortillas. Place remaining 2 tortillas on top, bean-side down. 4 of 4 Return skillet to medium-high heat. Coat skillet and tops of quesadillas with nonstick cooking spray. Cook one quesadilla 4 minutes per side or until cheese has melted, reducing heat to medium if tortilla becomes too brown. Repeat with remaining quesadilla. Cut both quesadillas in half and serve with salsa. Per Serving: 841 mg sodium, 6 g fiber, 3 g sat. fat, 86 mg chol., 9 g Fat, total, 26 g carb., 42 g pro., 354 kcal cal.